It’s my favorite time of year- the holiday season! Now that Thanksgiving has come and gone, I can officially get into the holiday spirit. Every year, I look forward to the parties and gatherings that happen around this time of year. Sadly, this year I’ll be missing a couple of work parties because I’m heading back to CA, but I am planning to go to my friend’s tree-trimming party this month. 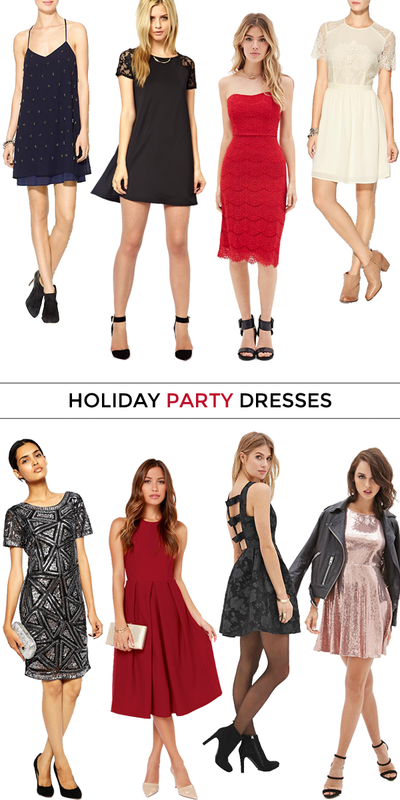 I wanted to round up a few dress ideas for those who’ve also got a few holiday parties on their calendar this month. Did you all have a nice weekend? I had a very relaxing weekend- it was wonderful. I didn’t really do much of anything but it was so nice to have some alone time and just hibernate a bit. I watched a lot of TV/movies, put up some twinkle lights, made an apple pie, started working on my Christmas card list, and did a bit of reading. It felt like a taste of the Christmas break that’s coming up. Just another 2.5 weeks to get through! Tell me: Are you hosting a holiday party this year or do you plan to attend one?